A repackaged and remastered 3CD set that compiles three of Diesel Guitar’s key 90’s works: “Maria” (1995), “Medium of Lights” (1996), and “Assimilation” (1999). “Medium of Lights” and “Assimilation” have always been particularly hard to track down, both having been released in very limited editions. All tracks were remastered by Kiyoharu Kuwayama (Lethe) in 2016. 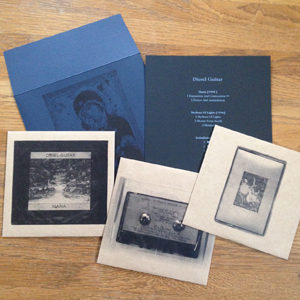 The individual sleeves provide printed reproductions of the original artwork and package design. Limited edition of 200. “Maria” (1995), “Medium of Lights” (1996) and “Assimilation” (1999) were a three-part solo work, where the album and track titles were deliberately designed to overlap and resonate with each other. Since the release of my first CD in 2002, I have concentrated on drone performance, so these three works record the final manifestation of the guitar amp feedback approach I used before. “Maria” was released by the Kyoto label G.R.O.S.S. in an edition of 120, but I released the other two works myself and they saw virtually no distribution. For a long time it has been difficult to hear my process prior to my first CD, so I am really grateful to be able to make these three works available again. Back in 1995, I visited the late Akifumi Nakajima, who ran G.R.O.S.S., at his home in Kyoto to discuss the release of “Maria”. I am pretty sure it was summer and we spent about two hours together. Nakajima talked to me about his record collection and his own works, and I remember being astonished at the scale of talents. In order to create this reissue, Satoru Higashiseto who oversees the musical side of Nakajima’s estate was kind enough to lend me Nakajima’s tapes and production materials which proved to be extremely valuable. I would like to take his opportunity to thank him. And to offer another prayer to Nakajima’s peaceful repose.